You Know GT150 How About GTRS GT200-II Box Mod? 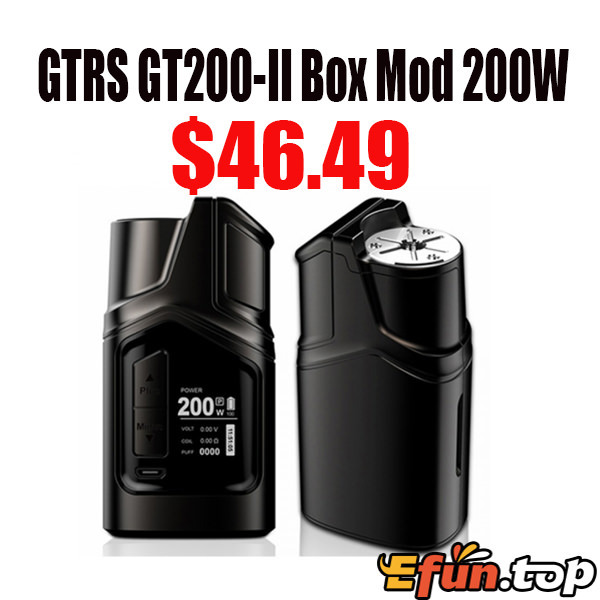 Before the GTRS GT150 was a hot sale on the vape market now GTRS GT200 Mod released. How about it? GT200 is the upgrade version of GT150, is a high-end electronic cigarette equipment designed and developed jointly by GaoMeiTe Tech. and LIMOU chip company. After thinking and experiencing for half a year, the well-known designer Alan(Alan won more than a dozen German's Red Dot Design Award in 2015-2016) made a leap breakthrough on the basis of the original GT150, strictly follow the ergonomic design,reset the new comfort height of 91mm,more sensitive and rapid with the distinctive fire button, upgrade the battery from the original built-in battery to removeable 18650 battery, more convenient, bring a truly comfortable experience to the user. Beautifully radian, concave and convex,the overall high-quality metal body, combined with superb ingenuity craft, to create a unique GT200. LIMOU chip, with independent intellectual property rights, supported by high-performance, highly innovative technique,innovative three powerful modes: mechanical mode, violent mode, curve mode; and have time display function, high-definition OLED large screen, easier to operation. Based on the original GT150, the GT200 upgrade from appearance, power and properties, make the apperrance more fashionable, power stronger,and performance more stable, more comfortable felling in hands, make users have a prefect experience when vaping, GT200 is overthrowing its sense of being, truly become your good partner in life! Powerfull: 10% increase power and heating rate.